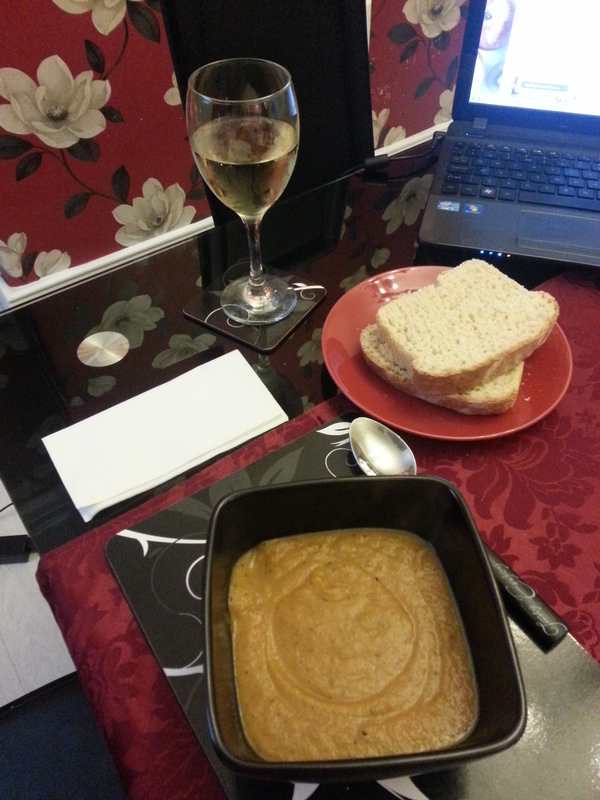 I’ve got the cooking bug again!! Much to the consternation of my poor purse, as cooking can be both cheap and equally expensive! This weekend I have been busy in the kitchen. With spring slowly ‘springing’ my desire to cook, (though not dampened by winter) has indeed ‘sprouted’ this past weekend, with that old eager feeling of excited anticipation gnawing at me. • 0.7 to 1 litre of vegetable stock. When I went to make this recipe I had not read the entire method properly. I thought it was just carrot and garlic soup, not roasted. So it took me longer, about 1 hour from start to finish. • In a roasting dish, I put in the carrots, onions and celery with some oil, salt, pepper and the cayenne. • While the vegetables were roasting, in a pan, I put two stock cubes in with 0.7lires of boiling water. I also added the chopped potato to the pan and seasoned it. Use 1 litre of stock to make enough for 4! 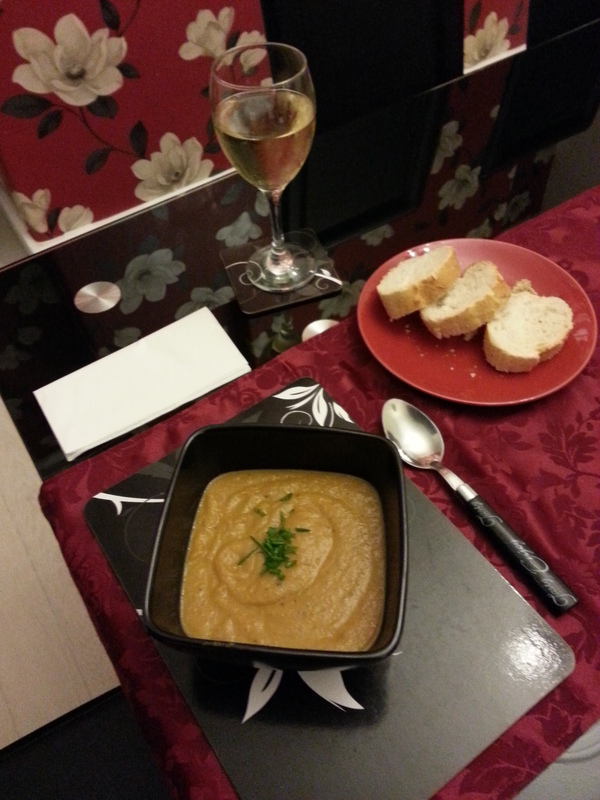 • Once the vegetables were roasted I added them, (the carrot, celery, onion) to the pan with the stock and potatoes. • I then squeezed out the garlic and added that too the pan with the vegetables and stock. I then boiled the pan for 15 minutes or until the vegetables were soft. • Then pop the mixture into a blender and blend until smooth. • Warm-up again and serve with a sprinkling of chives or freshly made bread. It made a slightly hot soup, reduce the amount of cayenne if you don’t like heat! 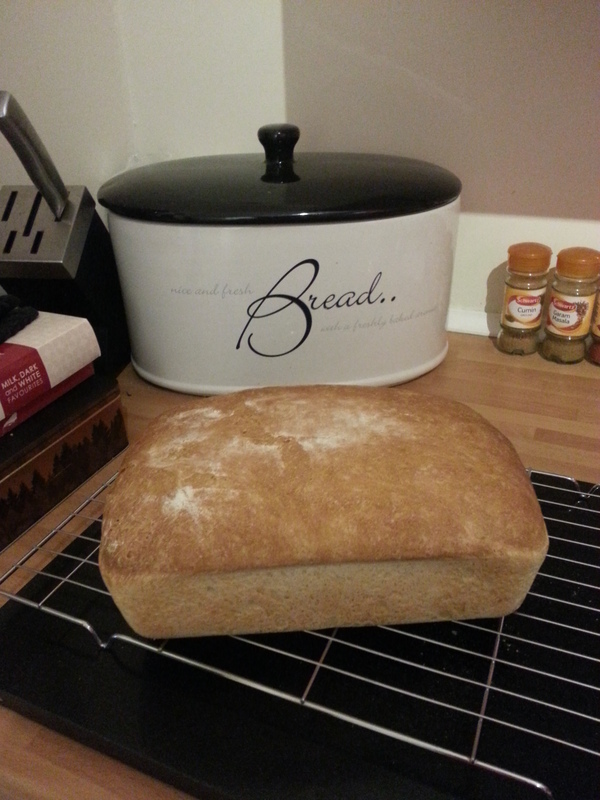 On Saturday I had bought some bread, but with more time on my hands on the Sunday, I decided to make a loaf of bread. I always use the BBC Good Foods, recipe. 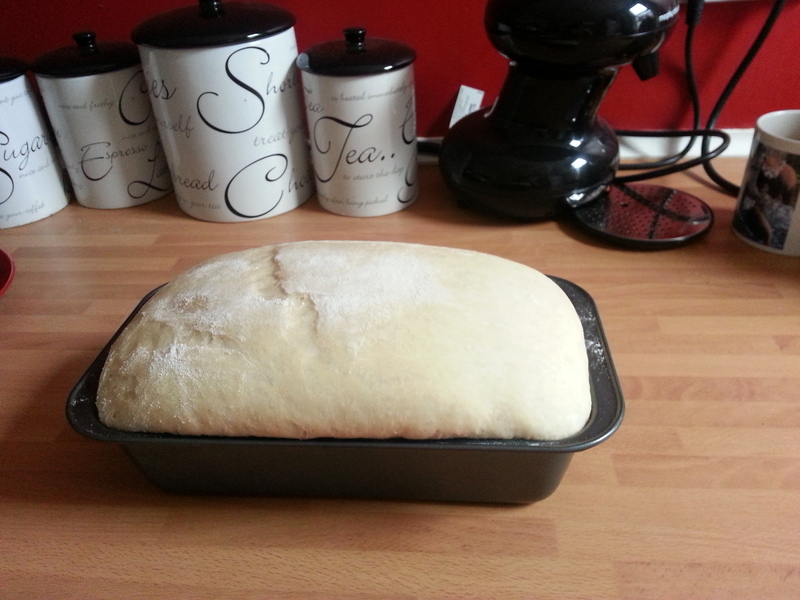 • 500g of strong white bread flour, plus more for kneading and dusting. • 300ml of water. I have mine tepid. • I have read recipes were they say knead to 15 to 20 minutes. I think I kneaded for more like 5-10. • Once the bread has come nicely together and is silky smooth, put in a bowl and leave in a warm place. I left it besides a radiator and left to prove for one hour. • ‘Knock back’ (I just knead the dough) for 5- 10 minutes, this knocks the air out of the dough, and then return to somewhere warm. I place the dough into a bread tin at this stage and leave for another one hour! You can leave for longer. • Once ready to put the dough in the oven, use a 200°/gas mark 6 for 25-30 minutes. The aroma of cooked bread is glorious. • Once cooked, tip the bread onto a rack to cool and then slice accordingly. Warm bread served with hot cooked soup is delicious and comforting! On Friday, the beginning of the weekend, after a long week at work, I made some Slimming World Chocolate Brownies, which only had four ingredients. • 30g of sweetener. The recipe said 70g of sweetener and another I read said 150g! That is two whole jars! I reduced the sweetener, but with trial and error the right amount can be discerned. • 1tbs of vanilla essence. I decided to make these for David’s mother and mine as it was Mothering Sunday in the UK, 15th March 2015. • Once all eggs were separated, I whisked the whites to soft fluffy peaks and then left to one side. • I then added to the yolks, sweetener, vanilla essence and cocoa powder together, adding a touch of water if it went too dry. • Afterwards, I folded in the fluffy egg whites into the chocolate mixture slowly, so as not to let the air out. • Once mixed pour into a baking tray lined with baking paper and cook for 25-30 minutes on 180°/gas mark 4. • I used a cocktail skewer to see if the brownies were cooked. Once clear I tipped onto a tray to cool. • Once cool I cut into squares. I think it made around 25 brownies and the recipe says only ½ a syn each. Here’s a link to a YouTube video showing how to make them! I found the brownies were rather leathery but would be nice with some ice cream or cream, and maybe some fresh fruit. I am not the biggest chocolate fan and only made them for family. I hope they liked them? So as you can see I have been productive in the kitchen. I look forward to making many more delicious dishes and sharing them with you!